Your football club is special, it is unique. No other club has your story, your history or your fans. 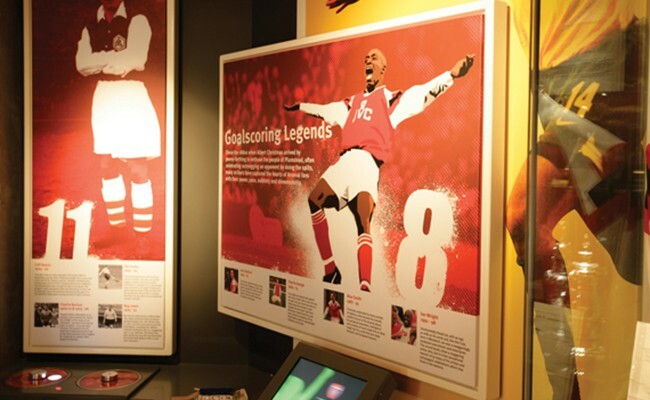 We’ve 5 tips on how to make your clubs museum more than just a trophy showcase. Your football club is special, it is unique. No other club has your story, your history or your fans. Though the names of past FA Cup winners are engraved into the cup forever, and the history books (well, google) give you the cold facts, they fail to tell the story of ‘that wet tuesday evening’, back when life was captured in black and white and you where 2 down before the bovril had cooled, with only 10 men and a ref who was defiantly in need of an eye test, your teams sheer will took hold of the game and wrestled it into a glorious, rapturous last minute victory. How do you convey that special feeling into a visitor experience? It is this that is at the heart of designing a successful football attraction. Whenever we approach a project such as a football museum we start with what makes the club unique. From here you can then begin to plan the experience properly, but where to start? There is a lot to consider – from accessibility and education through to the actual position of the museum and what it does on a match day – but what about the actual design of the exhibition? Here are 5 points we consider when beginning a project. Don’t just put a trophy with a label in front of me, give me a story to follow that no one else knows, an interesting narrative that flows through the space explaining the club, its origins, its people, the highs, the lows and anything in between. And don’t forget all those little stories that make your club so unique, the people that made a real difference or have a unique tale that adds to your club. Who are you looking to educate, entertain and inform? The general public, the local community? Perhaps you want to appeal to an international audience more, or maybe its to be a pilgrimage for your true, die hard fan. Whoever it is (and it can be more than just one specific group) needs to be kept at the centre of your thinking as you develop the experience. It is very tempting to put your entire collection on display. Who wouldn’t want to see all of those scarves, or every one of those programmes? It is a problem of noise, the story you are trying to tell becomes lost amongst all the clutter. Pace your exhibition, highlight the ideas you want to convey and discard the ones you don’t. Use objects, graphics and interactive content to support your story, not overload it. Football is a game, embrace that. Not every museum can have a full size training pitch for visitors to play on, but introduce interactive elements that not only help convey a message but do so in an interesting and fun way. Physical interactives, touch screen technologies and other audio and visual elements all add another layer of interest to the visitor. Just because its fun doesn’t mean its not educational. From the flow of the space or the layout of the sections, through to the approach of the graphics, and design of the signage – design will help keep your visitor engaged and moving. Graphics play a key role in conveying information, but also set mood and tone. Showcases aren’t just glass boxes to be filled with stuff, consider their layouts to make those objects sing. Design all the elements that make up your museum together so the graphics work with the space, with the objects and with the interactives. You want a considered and complete experience that really immerses the visitor in your club. Designing a successful museum experience means knowing that your club is more than just a collection of things to shove in a showcase. It’s the people, the history and that feeling you get on a Saturday afternoon. 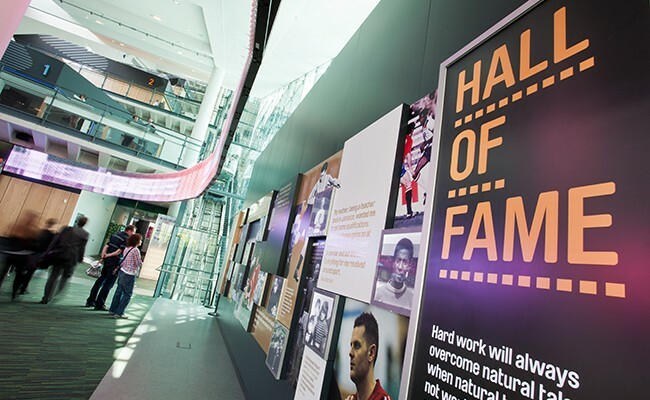 Use design effectively and you will have a museum that not only adds to your clubs unique story, but also engages and delights with fans of all ages. Football is called the beautiful game for a reason. We have designed the graphic elements (in partnership with museum design consultancy Mather & Co) for museum / exhibition / retail spaces at Arsenal FC, Chelsea FC, Manchester United FC, Wolverhampton Wanderers FC, Manchester City FC, the National Football Museum, Wembley Stadium, Wimbledon Lawn Tennis, Lord’s, Warwickshire CCC, Yorkshire CCC, South Africa Rugby, Norwegian Olympic, Volvo Ocean Race. Though the names of past FA Cup winners are engraved into the cup forever, and the history books (well, google) give you the cold facts, they fail to tell the story of ‘that wet tuesday evening’, back when life was captured in black and white and you where 2 down before the bovril had cooled, with only 10 men and a ref who was defiantly in need of an eye test, your teams sheer will took hold of the game and wrestled it into a glorious, rapturous last minute victory.